Editable royalty-free map of Bangladesh in vector-graphic online store. Capital City: Dhaka, located in the center of Bangladesh. Bangladesh is dominated by a vast multi-river basin and delta. The huge Brahamputra (or Jamuna) and Ganges (or Padma) Rivers meet in the center of the country and countless connecting streams and rivers, some of them very large, run between the two rivers or flow south into the Indian Ocean. A small coastal region (Chit- tagong) in the southeast is the only part of the country outside this network of rivers. Small hill regions in the northeast and southeast are the only topological variation of the land’s flat alluvial plains. This geography is both a gift, creating bountiful rice-growing land by the seasonal flux of great river systems, and a curse, making the population vulnerable to flooding. With some 90 percent of Bangladesh’s land within 33 ft (10 m) of sea level, the country is extraordinarily vulnerable to flooding due to its many great rivers and heavy rainfall. Bangladesh also has one of the world’s highest populations and is believed to be the most densely populated country on Earth. Bangladesh’s one major lake is largely an artificial one: Karnaphuli Reservoir (also known as Kaptai Lake), in the Chittagong Hill Tracts. It was for the most part formed by damming the Karnaphuli River in 1963 for hydroelectric power. Much smaller lakes called “mils” or “haors” are formed within the network of rivers winding across Bangladesh’s plains. The region around Sylhet is known as the Sylhet Plain, or the Surma River Plain. There and throughout the upper Meghna-Surma drainage area, the most distinguishing feature is the profusion of large and small lakes. This whole lake-dotted northeast quadrant of the Bangladesh Plain is even more vulnerable to flooding than the other parts of the country. 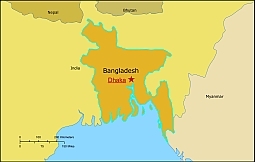 Bangladesh is formed by the great rivers that move the snow-melt of the Himalayas through India to their outlets in Bangladesh’s delta region. Rich soil is brought along by the rivers as old soil is carried away, and the rivers provide fish and transportation for the people of Bangladesh. The rivers also cause hardship due to seasonal flooding and shrinking land for settlement. The balance of water input and output is intrinsic to Bangladesh’s survival, and environmental policies in India, upstream, can have huge effects on Bangladesh. The river network of Bangladesh’s plain moves generally from north to south but includes untold numbers of feeder and effluent streams, like capillaries, flowing east, west, southeast, and southwest. Within Bangladesh’s riverine labyrinth, change is constant as rivers modify or shift their channels. The Ganges River of India, flowing southeastward, comes to the boundary of Bangladesh in the northwest of the country. For about 90 mi (145 km) the Ganges is the boundary between India and Bangladesh; it then continues to the southeast across the alluvial plain. In Bangladesh the Ganges is commonly called the Padma. The area south of the Padma is of very low elevation, and the hundreds of rivers and streams in this true delta segment of the plain are virtually all distributary from the Padma. Principal among them are the Madhumati River and the Arial Khan (also known as the Bhubanswar). Most flow south, and many of them reach the Indian Ocean. The result is a network of channels entering the Bay of Bengal through a crumbled seacoast that stretches for hundreds of miles, including part of India. It is often referred to as “the many mouths of the Ganges". 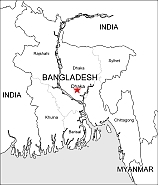 Bangladesh sits at the apex of the Bay of Bengal, a part of the Indian Ocean. Despite this, Bangladesh is a river nation rather than an ocean-oriented nation. Its ports, including the largest, Chittagong, are all river ports. The ocean often threatens catastrophe for Bangladesh, in the form of cyclonic storms and tidal bores. The tidal waves called bores recur from time to time in Bangladesh’s estuary areas and its stem rivers. Tidal bores tend to form high waves with abrupt fronts when the incoming surge of water at flood tide encounters a resistance, such as a sandbar. The funnel shape of the Padma- Meghna River estuary and the many channels between the islands are highly favorable to bore formation. A typical tidal bore rushes in with thunderous noise and a wall of water. Velocity and height are magnified if the tidal bore is backed by strong winds from the south, as occurs during cyclonic storms. Bangladesh experiences three seasons. The winter, from October to early March, has temperatures from 41°F to 72°F (5°C to 22°C). Then the hot season arrives in March with temperatures averaging 90°F (32°C). During the monsoon season, from May to September, tempera- tures average 88°F (31°C) with 90 to 95 percent humidity. Bangladesh’s economic resources are primarily agricultural. Bangladesh is a major rice producer, ranked 5th in the world in 1999-2000. The rice crop is largely used for domestic consumption. Jute (a fiber crop) and fishing are other significant economic resources. Important reserves of natural gas and some oil exist in northeast Bangladesh and offshore in the Bay of Bengal. Coal is found in western Bangladesh.